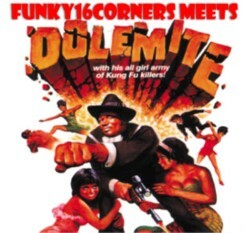 Because I have been working all day and have a party tonight, I have no time for more than this link to an extra Dolemite podcast, that is on my favourite soulblog, Funky16Corners. Larry, the man behind Funky16Corners, made this mix for a radioshow, Jazz Syndicate Radio, but he also put it up on his own blog. I happen to have two LP’s of Dolemite, but like I said, I am going to a party tonight, so these records will have to wait till another time. At the dinner table my son asked me: ”Are you really going to dance tonight like you do here at home? !” You bet!